Educational acronyms can be quite challenging when we don’t know what they mean. We're here to help! Below are some common acronyms and terms used in schools and a brief explanation for many of them to help you become more knowledgable about education termonology. ADM – Average Daily Membership. The number of days a student is in membership at a school divided by the number of days in a school month or school year. AR – Accelerated Reader. Software for primary and secondary schools used for monitoring the practice of reading. It was created by Renaissance Learning, Inc.
AYP – Adequate Yearly Progress. The measure by which schools, districts, and states are held accountable for student performance under Title I of the No Child Left Behind Act of 2001 (NCLB), the current version of the Elementary and Secondary Education Act. ELL – English Language Learner. Student whose first language is one other than English and who needs language assistance to participate fully in the regular curriculum. ESL – English as a Second Language. A program model that delivers specialized instruction to students who are learning English as a new language. LEP – Limited English Proficient. Student whose first language is one other than English who needs language assistance to participate fully in the regular curriculum and the statewide assessment system. LEA – Local Education Agency. This usually refers to a school district or charter. NCLB – No Child Left Behind. This national legislation reauthorized the Elementary and Secondary Education Act and has broad implications for the education of all children. PBIS – Positive Behavior Intervention and Support. A way to impact school learning environments by establishing and reinforcing clear behavioral expectations in order to support high student performance and to reduce behavioral problems. PBIS site schools work to integrate their Safe Schools Plans, character education efforts and strategies, and discipline efforts in order to make the schools caring and safe communities for learning. PD – Professional Development. The term refers to skills and knowledge attained for both personal development and career advancement such as continuous courses, workshops, activities and learning objectives aimed at helping professional educators and staff members improve their skills in their fields. PLC – Professional Learning Communities. PLCs are defined by collaborative inquiry, shared decision-making and joint planning of instruction among teachers. Teachers are provided structured time to work together in planning instruction, observing each other's classrooms, and sharing feedback. RTI – Response to Intervention. RTI is a multi-tiered framework that promotes school improvement through engaging, high quality instruction. Struggling learners are provided with interventions at increasing levels of intensity to accelerate their rate of learning. The three- tiered approach utilizes high quality classroom instruction, targeted interventions for small groups, and intensive individual interventions. SIP – School Improvement Plan. A plan that includes strategies for improving student performance. Title I. The largest federal education funding program for schools. Its aim is to help students who are behind academically or at risk of falling behind. School funding is based on the number of low-income children, generally those eligible for the free and reduced price lunch program. ISTEP+ – Indiana Statewide Test of Educational Progress. The state of Indiana test required for students in public schools in grades 3-8, given each spring. DIBELS – Dynamic Indicators of Basic Early Literacy Skills. A set of procedures and measures for assessing the acquisition of early literacy skills from kindergarten through sixth grade. ECA – End of Course Assessment. A state test given at the end of a specific course. Two course tests that students must pass to graduate are Algebra I and English 10. GED – General Education Diploma. 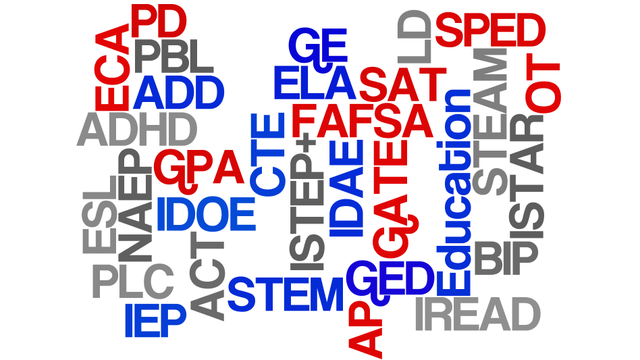 The General Educational Development (GED) Test is designed for people who, for various reasons, did not graduate from high school but want a certificate equivalent to the traditional high school diploma. ISTAR – Indiana Standards Tool for Alternate Reporting. A state assessment for students with disabilities who are exempt from the ISTEP+ and ECA. IREAD – Indiana Reading Evaluation and Determination. A 3rd grade reading assessment that is required by House Enrollment Act 1367. NAEP – National Assessment of Educational Progress. Also known as the “Nation’s Report Card,” NAEP assesses the educational achievement of elementary and secondary students in various subject areas nationwide. PSAT – Preliminary Scholastic Aptitude Test. This normally taken by high school students as a practice test for the SAT. Some schools use the PSAT as a diagnostic tool to identify areas where students may need additional assistance or placement in more rigorous courses. IEP – Individual Education Plan. A specific plan created for a child based on strengths and areas of focus. The IEP is required by federal law for all exceptional children and must include specific information about how the student will be served and what goals he or she should be meeting. OCR – Office for Civil Rights. An agency of the federal government's executive branch within the Department of Education. It is charged with enforcing a number of civil rights statutes including Section 504. 504 – Section 504 of the Rehabilitation Act of 1973. A civil rights statute which prohibits discrimination against individuals with disabilities. A 504 plan is an individual education plan for a special-needs student. Did you learn a new educational acronym while reading this blog? Know of one we missed? Share with us in the comments below! Help your peers to become more knowledgable as well by sharing this posting on social media using #AmGradIndy. Expeditionary Learning: What is it and Why Does it Work?